HDD drilling is short for horizontal directional drilling project, it is widely used for the pipeline work for the oil and gas transporting and etc. Normally, the drilling mud recycled from the HDD machine is to be reserved in a mud pit and the mud cleaning system, which is used to treat the mud to be next time use, treats the drilling mud from the pit and storage the well done mud in the tanks. In a traditional HDD mud recycling system, there arenormally 3 phase of separation equipmentincluding shale shaker, desander cones, desilter cones and mud mixing unit for adding new chemicals into the drilling mud, normally 2 jet mixing hoppers and mixing pumps. 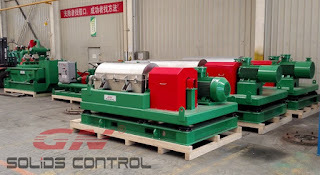 But now, as the environment demands and the cost pressure for the contractors are becoming more and more important, a lot of HDD contractors are taking decanter centrifuge into consideration in order to get better separation result and lower the mud weight. What is the main function of the decanter centrifuge used for the HDD drilling mud system? 1. The centrifuge helps to minimize the negative effect on the environment. 2. The centrifuge helps to reduce the weight of mud. 3. Centrifuge helps to lower down the total cost on mud. GNLW452C or GNLW452C-VFD is a very suitable model of decanter centrifuge to be used for the HDD mud recycling system. It is big bowl centrifuge of 18 inch bowl diameter and the speed of 1800 RPM is efficient for the HDD works, in China, the largest HDD contractor CPP, always use GNLW452 in their mud cleaning systems. The centrifuge feed pump could transfer the mud from the storage tank to the centrifuge and after the separation, the mud could directly fall back to the same tank, cycling like this helps to reduce the mud weight. Or, there could be another storage tank to collect the drilling fluid from the centrifuge. Welcome to contact GN for more suggestion and learn more information about other equipment such as mud gas separator, shear pump, mud mixing system and drilling waste management equipment..